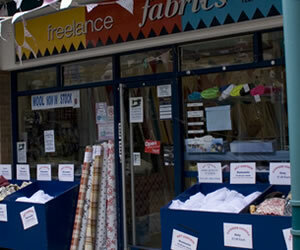 In my student days, there was a brilliant fabric and haberdashery shop in Oxford, King’s Fabrics. It was right in the city centre and, as far as I could tell, was largely frequented by students looking for fabric to make bop costumes out of, such as my below creations. This one was for a jungle themed bop. It’s just a bad camera angle, those guys are not really making out in the background! 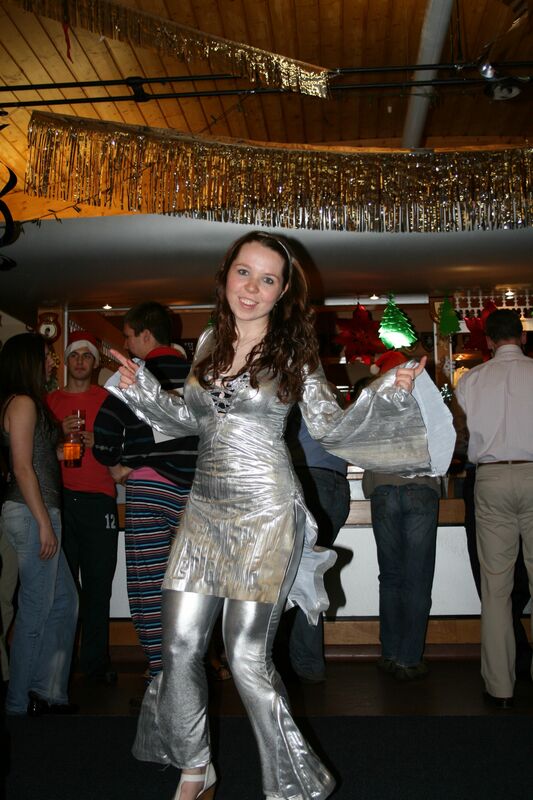 And this was for a 70s/ABBA themed party (it also doubles up as a good Christmas angel) – not actually a college bop – there’s way too much fabric for that – given that these things took place in a hot and sweaty underground beer cellar, the idea was generally the skimpier the better. So dedicated was I to this costume that I took it to work to sew during my lunch hours, which my manager thought was hilarious. I had no sewing machine in those days, and such was my faith in my sewing that I took needle and thread along to the party with me in case it all came apart and I needed to do emergency repairs. Turns out it was a good thing I did, although it wasn’t my sewing that came undone – it was the seams of the silver leggings – the only part I hadn’t made myself! Outfit finished off perfectly with white patent wedges – cost me a whole £1 from Primark! 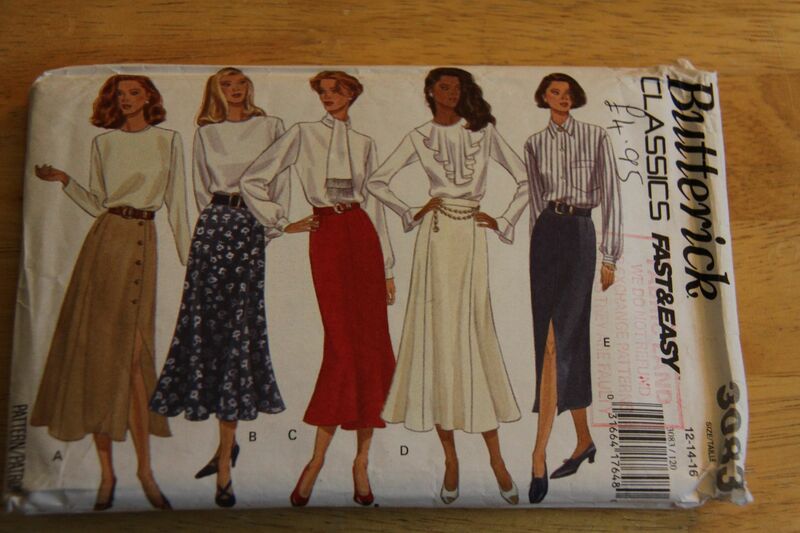 Unfortunately, King’s Fabrics shut down a few years ago. Who knows how bop costumes are created now. I suspect Primark is probably the source of cheap and sometimes ridiculous looking clothing. The loss of King’s means that there aren’t really any decent fabric shops in Oxford (that I know of, please correct me if I’m wrong! ), which is a real shame. 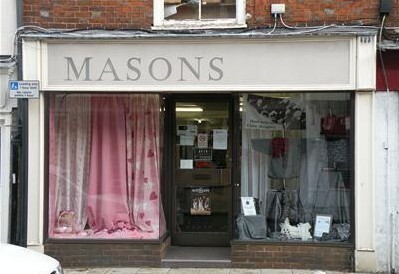 I did spot a new yarn shop, which also does some haberdashery bits, on Cowley road last week, but The nearest haberdasheries are Masons in Abingdon, and Freelance Fabrics in Kidlington. Dunelm Mill and Hobbycraft both opened in Oxford last year as well, which both have a limited selection of fabric and sewing-related items. I’ll give a little rundown on each of these. 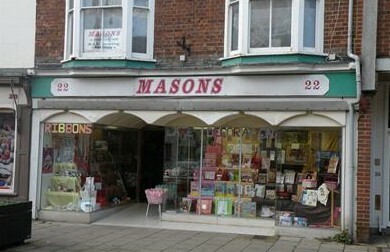 Masons really is the quintessential haberdashery. 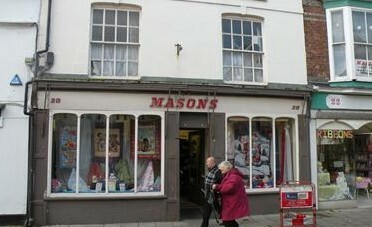 There are actually 3 separate shops – one that specialises in knitting yarns, needles etc, as well as curtain-weight/upholstery fabrics, one that does dressmaking fabrics, as well as general haberdashery and sewing notions, and one that does more general craft supplies – beading, jewellery making, card and paper craft, cake decorating etc, but also has a nice selection of lace and trims upstairs. The one that has upholstery fabric has a pretty good selection, both of more traditional style stuff, as well as some of the designer patterns like Clarke & Clarke. These are a little pricy though – about £12/m for a lot of them. They also have SO much yarn! The other shop has a brilliant selection of dress making fabrics, all of which are fairly well organised. The prices vary a lot – from the £2-3 plain polycottons, £5/m or so for the cheapest printed polycottons, right up to £15+ for some prints. They do have some good buys though – I bought some black, slightly patterned, suit like material to make a work dress out of and that cost me £2.99/m. They also have a good selection of interfacings, which are reasonbly priced, as well as a fairly decent range of zips, which aren’t too bad actually – depending on what type, you can pay about 80p for a zip, which is a lot compared to Walthamstow Market, but decidedly cheap compared to places like John Lewis! They also have plenty of buttons, threads of different prices ranges, and also patterns. Annoyingly for me, Masons are only open 9-5 Monday – Saturday, so Saturday is the only day I can ever go, which is tricky fitting in, but also means that it’s often very busy in there. I’ve have heard that if you can go during the week, then you tend to get slightly better service. Freelance Fabrics in Kidlington has a much smaller range of fabrics, but does have some good deals, depending on what you want. They have a room at the back full of curtain weight fabric all for £3.50 a metre. They do tend to be larger prints rather than things like polka dots, but they have a really nice selection of colours and designs. 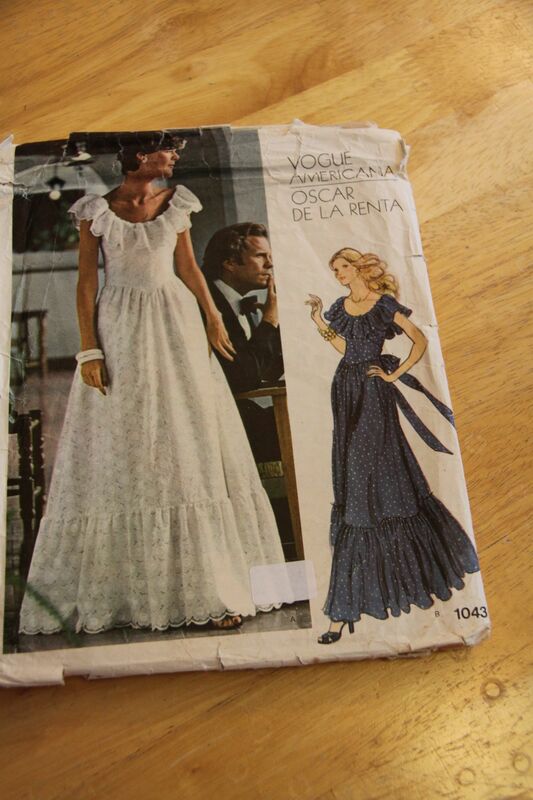 They have also recently started doing more dressmaking fabric. They have some really pretty printed polycottons, all for £1.99 a metre, although their plain polycottons are all about £3.50. Cotton (plain or printed) seems to be mainly in the region of £5-6 a metre, although they do have some more expensive stuff as well. They have a selection of haberdashery items, although it’s not huge. They also have a selection of wool, threads and trims. One of my favourite things is that they have some bargain bins outside where they sell off end of roll pieces for £1/m – sometimes 4-5m pieces, so you can get a good bargain. The staff here are all really friendly as well, and they’re open 7 days a week. Dunelm Mill and Hobbycraft recently opened one of the retails parks on Botley Road. They both had a limited selection, but they are 2 doors away from each other, and are open into the evening, so if you really need to get something in Oxford, or of an evening, they come in handy. Dunelm has a pretty good selection of curtain materials, and at not too unreasonable ptices – some of the Clarke & Clarke fabrics which generally retail for about £12-13 they sell for about £8. They also sell some of their oilcloth fabric for about £2.99/m sometimes. They do have a few lighter weight fabrics, but mainly just a few different coloured polycotttons. They also sometimes sell off end of roll stuff for £2.99/m. They have a few sewing machines, and some general haberdashery items, mainly Hemline stuff. They also have a small selection of wool and knitting needles (and the knitting needles in here generally tend to all be slightly cheaper than in Hobbycraft). Hobbycraft has a slightly wider variety of haberdashery stuff, although limited fabric, and it’s pretty expensive for what it is. I’ve never actually bought any fabric from here, and haven’t ever really given it more than a passing glance! They do have a fairly good selection of yarn though, and they often have that on 3 for 2. For cheaper fabric, I’ve been to Fabricland in Reading, which has a reasonable, but not huge selection, although generally at slightly better prices than Masons. For more choice, it really has to be a trip to London – either to Walthamstow, or to Goldhawk Road, which I am yet to check out – I feel a shopping trip coming on! Where are your favourite places to shop for fabric locally where you are? I’ve managed to acquire a couple of new sewing books recently. 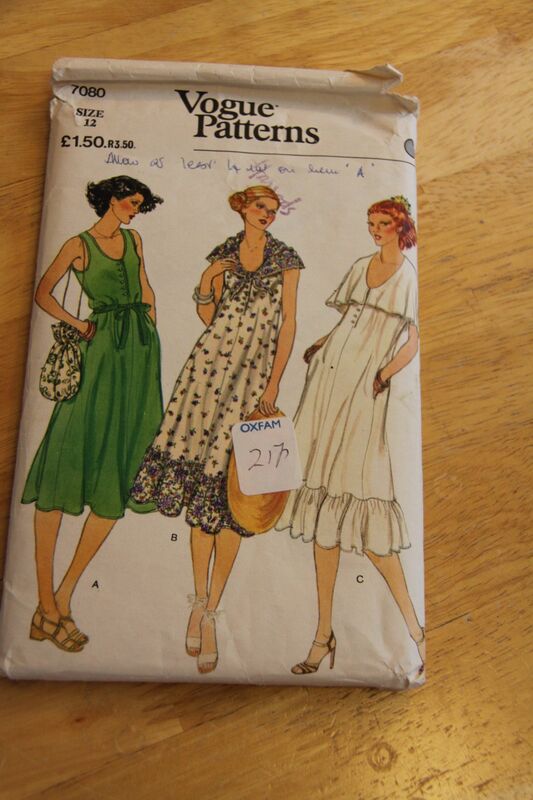 Whenever I walk into town at lunchtime, I tend to pop into the Oxfam book shop to see if they have any vintage (or modern) sewing books that I can pick up. Up until now, I’ve never had any luck, but the gods were on my side recently. I found not one, but two sewing books there on one occasion, for a couple of pounds each. 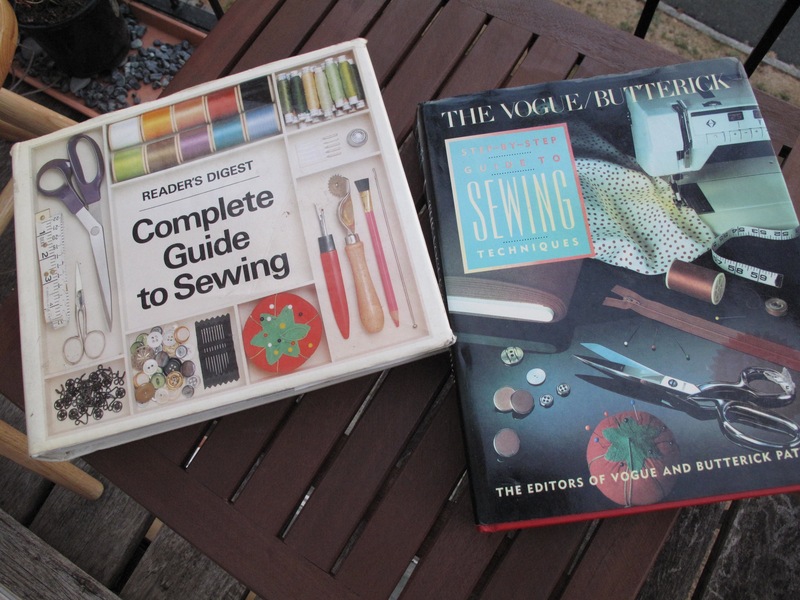 One is the Vogue/Butterick step-by-step guide to sewing, and other is the Reader’s Digest complete guide to sewing. I do already have this one (it was my dad’s first Christmas present to my mum, about 40 years ago, but it never really got used, so they passed it on to me last Christmas! ), but I’ve heard a few people say it’s one of the best sewing books they’ve come across, so I bought it as a future present for one of my sewing friends. The following week, I managed to also get the Reader’s Digest complete guide to needlework. 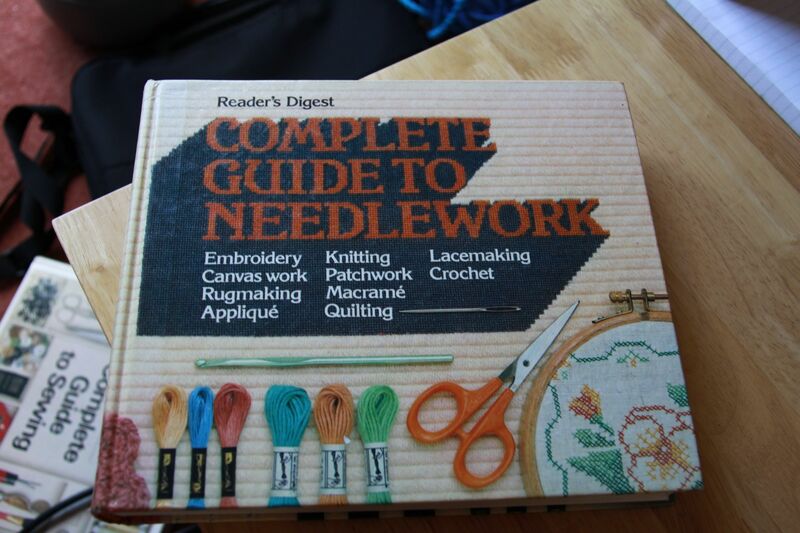 It’s got some good stuff on applique, quilting, knitting and crochet, so hopefully another good reference book! I also bought the Colette Sewing Handbook recently, so I’ve got lots of reading material to work my way through! Must actually find time to sit down and read them now – I’m one of those people who seems to think that by owning books, I can absorb the information in them by osmosis – I really wish this worked!